I swear these were my words until i had this issue :sweat: I pretty much avoided every other vape where you can't use dosing caps. I have it with all my caps. I don't have a brand new one but some were used maybe 1 or 2 times. I cleaned my caps with iso and a brush so i thought maybe too much iso is not good but some of them never met a drop of iso. Actually the newer the caps are the heavier the abrasion is. I don't know why this is happening now. I'll show to S & B, maybe they know something. 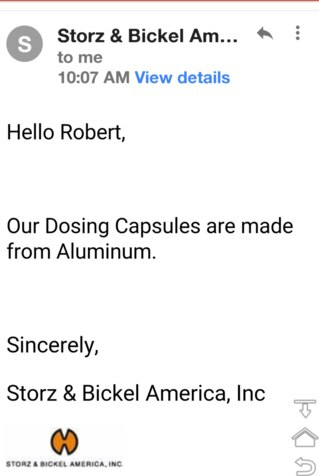 Does anybody have a guess about the type or grade of aluminum these capsules are made of? 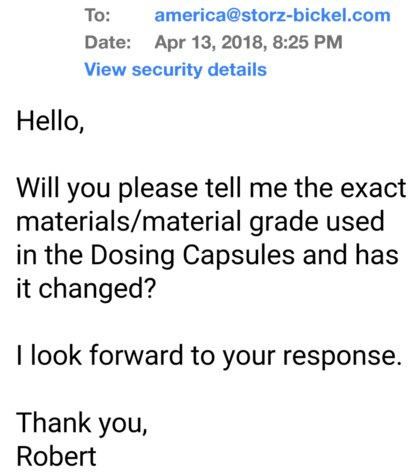 I have emailed S&B about a dosing capsule material/grade/changes.......Will post response. Here's my email, and the S&B reply. I've included their ph#. Gotta love the answer. I emailed S&B again. Their second reply is included. I think what they are saying is the caps are made of pure aluminium. In which case there aren’t different grades as it’s an element. The grades are for alloys and if it’s 100% Al then it’s just pure aluminium (plus any oxide formed on the surface). This thread compelled me to give these a try, and I just thought to check my Crafty box since I got one a few months ago. S&B kindly included one for me to sample, and now I'm sold on them. This really makes the S&B portables complete for on the go use, I am getting into infused e liquids more for portability, but the Crafty will remain in the lineup as well. With the Crafty, an external charger slightly smaller (10,000mAh capacity 2A output), USB cable, and the dosing capsules prefilled, extended use will be great when traveling. Assuming fully charged batteries to start, that would be a little over 200 minutes estimated runtime if there would be no available electricity. @Fonz Here was my final attempt to get a straight answer from S&B. 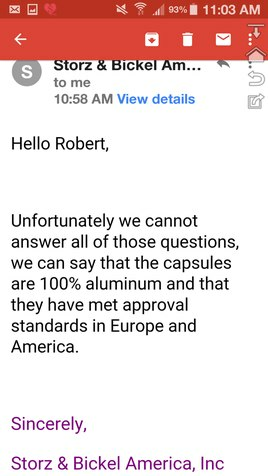 I agree with @welshman that they are saying the capsules are 100% aluminum, but I don't have those words from them. I appreciate the expedient reply. I've had capsules for a year without issue. 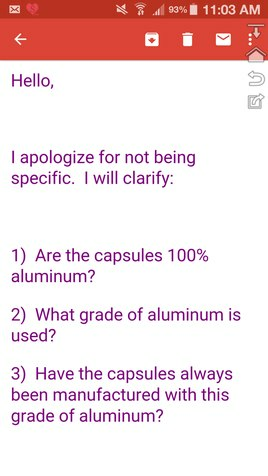 However, my friend recently bought them, used them twice, cleaned with ISO and water, and the cloth used to dry the capsules has a residue coming solely from the capsules aluminum. This event made me concerned about the safety of using the capsules. Are they RoHS certified? Are they safe? What testings and certificates have been awarded? I apologize for another email, but I feel health concerns are of utmost relevance and warrant more information. We would assume that the residue is from whatever material was used in the capsule, they are single use, not multi use. If you happen to get them open and re-use them then you are fully allowed to do that as you own them. I bought the filling tray kit from S&B. It comes with a grinder and some other tools. It also includes a tiny scale for which I really have no use as it's not the greatest for microdosing. If I were to fill up a bunch of capsules do you think I should keep them in the same cVault where I store the same material? I thought having them in a container with a Boveda pack would keep them from getting too dried out. I'd also avoid having to use a second container for just capsules. After a surgery a few years ago I filled several capsules at a time and just used them over the course of a few days. I really need to move back to the capsules as they keep the Mighty very, very clean. I wish I'd continued using them. Yeah just make sure to use a Boveda pack specifically optimized for cannabis storage. I know many have used the packs for cigars, but the humidity is a bit too high for storing cannabis. According to medicaljane.com, the best cannabis engineered Boveda packs maintain 62% relative humidity. The only other consideration is the Boveda pack size, it needs to be large enough to accommodate all the material. Thank you for making me look into Boveda packs. A buddy of mine asked about long term cannabis storage, and this seems to actually be a GREAT option. Even with containers opened often, Boveda packs should last around 2 months. For containers not opened often, they can even last up to a year. A 10 pack that can "treat" up to an ounce of herb with a single pack, is only $14.25 for the set. That is totally worth it, under $1.50 to keep one ounce costly buds fresh and from degrading for at least two months. The main disadvantage of buying large quantities is the degradation. I wonder if this is a way to get a great discount, but still keep buds fresh. @BobCat Thanks for the efforts. I didn't find the motivation myself till now cause i kind of expected an answer like this by S&B. It's a little disappointing. I still don't use the caps and right now not even any S&B vape. Friends tell me i'm kind of paranoid or just pissed. Made me promoting the Vapcap to my daily driver. Other options are coming. I love the dosing capsules makes the mighty much more efficient.you can smoke bowl after bowl without any cool down . Always put your capsule in after heat up to avoid the burn. You're welcome. I haven't used my capsules in a while, and I never had the issue you do. Enjoy the Vapcap! I got an M with Ti tip on a 420 sale and am figuring the vape out- pretty cool so far. The caps were a reason to make the Mighty my first vape. I fell in love with the design and thought i would never use something else. But there are, lets say, more interesting vapes out there and i like rituals. The Mighty can't to anything a Vapcap couldn't do. You just have to learn it. After a few days you're rolling perfect through temps and cloud sizes. I at this time consider the S and B Vapes out dated. They perform like a big strong horse lots of power. The newer vapes (Example: MV1) perform like the latest sports cars. Dosing capsules I enjoyed before I moved on to the newer vapes. I found the capsules enjoyable and very easy to use. The series of stainless screens, I have learned cause the harshness in the vapor from the S and B vapes. The dosages capsules because its aluminum helps cool the harshness. Another reason you should get the dosage capsules. I agree with your comparison of the Fire Fly 2, Flat Volkswagon. But this Volkswagon is in the shop because even after you get it started it stops running. If you're a newby like me and you don't have much tolerance, and you bought the Crafty before you really understood the difference between session and on-demand vapes...what is smallest amount of herb you can effectively vape in a dosing capsule for one person that is pretty sensitive (as it turned out 4-5 long draws in full capsule first time around was way too much)? When packing capsule say only 1/4 full, does something need to be resting on herb to keep it from moving around or can there be empty space above it before the cap of the dosing capsule? Also, does length of time between draws impact greatly the effects of the herb? How long can you wait between draws before you're wasting your herb? Sorry for all the beginner questions..stuff I need to know. You can put a small load in the caps and then top it with the capsule liquid pad which is made for concentrates. It will work fine. Likewise, you can put your smaller load into the native oven and top it off with the regular liquid pad. I find the liquid pads help run smaller loads and add a bit of conduction heating at the end of the session for more even AVB. Tbh, I sort of view .1 g as a kind of minimum load for crafty/mighty. As for length of time between draws...yes, there is a conduction component to the Crafty/Mighty hybrid heating system so if you left the unit on with a load in it and didn't draw, it would cook your load eventually. These are session devices and need to be used that way. Thanks for the input. I'll try .1 with a friend next time to see how many draws that produces. I'll order some capsules with the concentrate pads in them as the concentrate pad that came with the Crafty for the oven is too big for the capsule. I saw somewhere someone who posted pics of their capsule set up. I'm not sure, but I think I remember them using some kind of screen in the capsule for a smaller dose, but I can't find that site or forum anywhere..Can't remember where it was. I have to improvise until I can handle a full session myself, AND I have to find the right strain that is a little more forgiving in the meantime. Anyway this is helpful, thanks. Just a thought on the abrasion thing. Does your friend use the stainless steel drip pads in his aluminium box? That might cause serious corrosion and might explain some issues raised here.. I am not sure. But I am a Big fan of the capsules. Same strength but really enjoy vapor. The Capsules take a way harshness. It feels like a different vape. What diameter is a 100 mg Dosing Capsule? ?